The IonSpa™ Detoxifying Foot Bath produces positive and negative ions that circulate throughout the body to remove toxins and rebalance cellular communication. While the body’s natural electrical impulses generally flow easily, age, injury, and illness can affect that flow. The IonSpa™ assists your body in detoxifying toxins and re-establishing its natural balance. 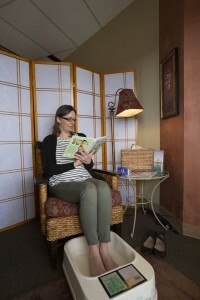 Users of the IonSpa™ Detoxifying Foot Bath testify to a healthier lighter feeling after a session. The ionic foot bath operates through a process called electrolysis by passing direct electrical current through water to break apart the H2O (water) molecule. This releases oxygen, stable hydrogen and the negative hydrogen ion (H-), the core benefit of an ionic foot bath session. This negative hydrogen ion is a powerful antioxidant, pH balancer and the catalyst most responsible for ATP (adenosine tri-phosphate) production, our body’s greatest energy resource. In the past, we received the negative hydrogen we needed through the consumption of raw vegetables and light proteins but modern processing, storage and handling has virtually stripped the modern diet of this increasingly vital element. Gentle and relaxing ionic foot bath sessions allow the body to uptake this “fuel of life”, which is essential in balancing and reenergizing the body’s natural ability to purge toxins and heal itself. When experiencing the IonSpa™ Detoxifying Foot Bath, you will see the water change color as the electrical current, water, and magnetic field interact with your feet. While the water would change color by itself, the colors are noticeably different with feet in the foot spa and from one person compared to another. Ionic foot baths are not the first types of products to try and extract this powerful negative H ion and absorb it into the body. Since the 1950s, manufacturers have produced dozens of ionic generators for laboratory and home use. Early machines ionized atoms and molecules via high-voltage electrical fields, incandescent materials, ultraviolet light, x-rays and alpha or beta radiation from isotopes. Advanced technology has eliminated many problems associated with previous ion devices. The IonSpa™ Detoxifying Foot Bath creates a high voltage with lower current, thereby reducing or eliminating the production of ozone. Our patented Intelli-Drive technology maintains a constant level of ionization throughout the course of the foot bath, increasing its effectiveness by over 10 times.